Germinant receptor proteins cluster in ‘germinosomes’ in the inner membrane of Bacillus subtilis spores. We describe a protocol using super resolution microscopy and fluorescent reporter proteins to visualize germinosomes. The protocol also identifies spore inner membrane domains that are preferentially stained with the membrane dye FM4-64. Wen, J., Pasman, R., Manders, E. M., Setlow, P., Brul, S. Visualization of Germinosomes and the Inner Membrane in Bacillus subtilis Spores. J. Vis. Exp. (146), e59388, doi:10.3791/59388 (2019). The small size of spores and the relatively low abundance of germination proteins, cause difficulties in their microscopic analyses using epifluorescence microscopy. Super-resolution three-dimensional Structured Illumination Microscopy (3D-SIM) is a promising tool to overcome this hurdle and reveal the molecular details of the process of germination of Bacillus subtilis (B. subtilis) spores. Here, we describe the use of a modified SIMcheck (ImageJ)-assistant 3D imaging process and fluorescent reporter proteins for SIM microscopy of B. subtilis spores’ germinosomes, cluster(s) of germination proteins. We also present a (standard)3D-SIM imaging procedure for FM4-64 staining of B. subtilis spore membranes. By using these procedures, we obtained unsurpassed resolution for germinosome localization and show that >80% of B. subtilis KGB80 dormant spores obtained after sporulation on defined minimal MOPS medium have one or two GerD-GFP and GerKB-mCherry foci. Bright foci were also observed in FM4-64 stained spores’ 3D-SIM images suggesting that inner membrane lipid domains of different fluidity likely exist. Further studies that use double labeling procedures with membrane dyes and germinosome reporter proteins to assess co-localization and thus get an optimal overview of the organization of Bacillus germination proteins in the inner spore membrane are possible. Spores of the orders Bacillales and Clostridiales are metabolically dormant and extraordinarily resistant to harsh decontamination regimes, but unless they germinate, cannot cause deleterious effects in humans1. In nutrient germinant triggered germination of Bacillus subtilis (B. subtilis) spores, the initiation event is germinant binding to germinant receptors (GRs) located in the spore’s inner membrane (IM). Subsequently, the GRs transduce signals to the SpoVA channel protein also located in the IM. This results in the onset of the exchange of spore core pyridine-2,6-dicarboxylic acid (dipicolinic acid; DPA; comprising 20% of spore core dry wt) for water via the SpoVA channel. Subsequently, the DPA release triggers the activation of cortex peptidoglycan hydrolysis, and additional water uptake follows2,3,4. These events lead to mechanical stress on the coat layers, its subsequent rupture, the onset of outgrowth and, finally, vegetative growth. However, the exact molecular details of the germination process are still far from resolved. A major question about spore germination concerns the biophysical properties of the lipids surrounding the IM germination proteins as well as the IM SpoVA channel proteins. This largely immobile IM lipid bilayer is the main permeability barrier for many small molecules, including toxic chemical preservatives, some of which exert their action in the spore core or vegetative cell cytoplasm5,6. The IM lipid bilayer is likely in a gel state, although there is a significant fraction of mobile lipids in the IM5. The spore’s IM also has the potential for significant expansion5. Thus, the surface area of the IM increases 1.6-fold upon germination without additional membrane synthesis and is accompanied by the loss of this membrane’s characteristic low permeability and lipid immobility5,6. While the molecular details of the activation of germination proteins and organization of IM lipids in spores are attractive topics for study, the small size of B. subtilis spores and the relatively low abundance of germination proteins, pose a challenge to microscopic analyses. Griffiths et al. compelling epifluorescence microscope evidence, using fluorescent reporters fused to germination proteins, suggests that in B. subtilis spores the scaffold protein GerD organizes three GR subunits (A, B and C) for the GerA, B and K GRs, in a cluster7. They coined the term ‘germinosome’ for this cluster of germination proteins and described the structures as ~300 nm large IM protein foci8. Upon initiation of spore germination, fluorescent germinosome foci ultimately change into larger disperse fluorescent patterns, with >75% of spore populations displaying this pattern in spores germinated for 1 h with L-valine8. Note that the paper mentioned above used averaged images from dozens of consecutive fluorescent pictures, to gain statistical power and overcome the hurdle of low fluorescent signals observed during imaging. This visualization of these structures in bacterial spores was at the edge of what is technically feasible with classical microscopic tools and neither an evaluation of the amount of foci in a single spore nor their more detailed subcellular localization was possible with this approach. Here, we demonstrate the use of Structured Illumination Microscopy (SIM) to obtain a detailed visualization and quantification of the germinosome(s) in spores of B. subtilis, as well as of their IM lipid domains9. The protocol also contains instructions for the sporulation, slide preparation and image analysis by SIMcheck (v1.0, an imageJ plugin) as well as ImageJ10,11,12. Streak a bacterial culture on a Luria-Bertani Broth (LB) agar plate (1% tryptone, 0.5% yeast extract, 1% NaCl, 1% agar)13 and incubate overnight at 37 °C to obtain single colonies. Use the B. subtilis KGB80 (PS4150 gerKA gerKC gerKB-mCherry cat, gerD-gfp kan) strain and its parent background strain B. subtilis PS4150 (PS832 ΔgerE::spc, ΔcotE::tet) as described previously7. NOTE: The use of spores with the ΔcotEΔgerE background is essential in germinosome visualization, in order to minimize the autofluorescence of the spore coat layers7. Sterilize all media, tubes, pipets and other culture materials to be used with appropriate methods. Inoculate a single colony into 5 mL of LB medium early in the morning and incubate the culture under continuous agitation in a screw cap tube at 200 rpm/min and 37 °C until the OD600 reaches 0.3-0.4 (approximately 7 h). Make 500 mL of MOPS medium (pH 7.5) containing 3 nM (NH4)6Mo7O24·4H2O, 0.4 μM H3BO3, 30 nM CoCl2·6H2O, 10 nM CuSO4·5H2O, 10 nM ZnSO4·7H2O, 1.32 mM K2HPO4, 0.4 mM MgCl2·6H2O, 0.276 mM K2SO4, 0.01 mM FeSO4·7H2O, 0.14 mM CaCl2·2H2O, 80 mM MOPS, 4 mM Tricine, 0.1 mM MnCl2·2H2O, 10 mM D-glucose-monohydrate, and 10 mM NH4Cl. Prepare in screw cap tubes 10-1- 10-7 serial dilutions of the LB culture in 5 mL MOPS medium each and incubate the cultures overnight under continuous agitation at 200 rpm/min and 37 °C. NOTE: The serial dilutions prepared here aim to obtain a dilution in early exponential phase in the next morning. This step and the next step are necessary to allow the cells to adapt to the MOPS buffered growth medium. Select one of the MOPS dilutions with an OD600 of 0.3-0.4. Inoculate 0.2 mL of the culture to pre-warmed (37 °C) 20 mL of MOPS medium in a conical 250 mL flask and incubate under continuous agitation until the OD600 reaches 0.3-0.4 (~7 h). Inoculate the MOPS based sporulation medium (250 mL) with 1% (v/v) pre-culture from step 1.3.1 and incubate for 3 days at 37 °C in a conical liter flask under continuous agitation. For FM4-64 staining of PS4150 spores, add 2 µg/mL FM4-64 probe (see Table of Materials) to the sporulation medium 1 or 2 h after reaching the peak OD600 value of vegetative growth (generally approximately 2) and allow the culture to subsequently sporulate whilst protecting it from light5. Determine the sporulation yield (spores vs vegetative cells) using phase contrast microscopy at 100X magnification to distinguish the phase bright spores from phase dark cells and possibly non-mature spores. A 90 % phase bright spore yield is expected. Pellet the spores at 4,270 x g for 15 min at 4 °C in round bottom centrifuge tubes. Wash the spore pellet 2-3 times with 40 mL of sterile ultra-pure Type 1 demineralized water in 50 mL conical centrifuge tubes (see Table of Materials). Spin-down at each wash at 4,270 x g for 15 min (4 °C). 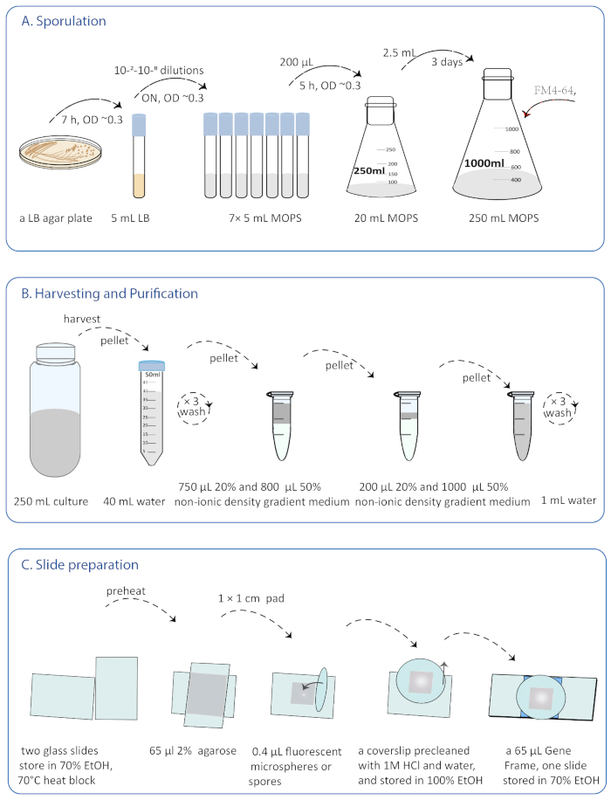 Spore purification: Suspend the spore pellet in 750 µL of 20% nonionic density gradient medium (see Table of materials) and load onto 800 µL of 50% nonionic density gradient medium in sterilized microcentrifuge tubes. Centrifuge for 60 min at 21,500 x g. The pellet obtained contains the free spores. Suspend the spore pellet in 200 µL of 20% nonionic density gradient medium and load onto 1 mL of 50% nonionic density gradient medium in a microcentrifuge tube, and centrifuge for 15 min at 21,500 x g.
Washing the final spore preparation and storage: The pellet obtained contains the purified dormant spores. Wash the spore pellet 2-3 times with 1.5 mL of sterile ultra-pure Type 1 water (see Table of Materials) and spin-down in between at 9,560 x g for 15 min at 4 °C. Finally, suspend the pellet in sterile ultra-pure Type 1 water to a final OD600 of approximately 30. Aliquots of the spores can be stored at -80 °C for 8 weeks14. Treat PS4150 spores with 0.1 M NaCl/0.1 M NaOH/1% sodium dodecyl sulfate (SDS)/0.1 M dithiothreitol (DTT) at 70 °C for 1 h. Wash the spores 10 times with sterilized ultra-pure Type 1 water15,16. By doing so, any adsorbed FM4-64 probe in spore’s outer membrane and outer layers will be removed. Pre-clean high precision coverslips (see Table of materials) with 1 M HCl for 30 min in a gently shaking water bath. Wash the coverslips twice in ultra-pure Type 1 water, and store them in 100% (vol/vol) EtOH. Let them dry and verify their clarity before use. Pre-clean the glass slides in 70% EtOH. Let them dry and verify their clarity before use. Pre-warm two 70% EtOH cleaned and air dried glass slides (see Table of materials) for several seconds on a 70 °C heating block, drop 65 μL of sterilized 2% agarose held at 70 °C on top of one glass slide and place the other glass slide on top to spread the agarose between the slides. The agarose patch will dry in approximately 5 min. Cut the agarose patch into a 1 x 1cm section after removing one of the glass slides, add 0.4 μL of sample (fluorescent microspheres or spores of ~108/mL), and transfer the patch onto the high precision coverslip by placing the coverslip onto the patch and sliding it off. Fix a Gene Frame (1.5 x 1.6 cm2, 65 µL) onto the dried slide, onto which the coverslip is placed closing all corners of the frame, thus completing the slide for use in microscopy. Capture the transmission and fluorescence images of spores as well as a mixture of red and yellow-green carboxylate-modified fluorescent microspheres on a Structured Illumination Microscope (see Table of materials) equipped with a 100x oil objective (Numerical Aperture = 1.49), a CCD camera and image analysis software (see Table of materials). Generate all images at room temperature without the disturbance of ambient light. Make sure to always clean the 100x objective and the slide with 75% ethanol before imaging. Focus on 100 nm (diameter) fluorescent microspheres and optimize the point spread function (psf) by adjusting the correction ring on the 100x objective until a symmetric psf is obtained, thus minimizing blurring of the image. The psf is the impulse response or the response of an imaging system to a point source or point object. Select a field of view with approximately 10 round fluorescent microspheres. Apply a grating focus adjustment for both 561 nm and 488 nm excitation wave lengths as the guide for the image analysis software. Focus the spores with the transmission light and capture a transmission light image in the 16× average mode with 200 ms exposures for each image. Capture 3D-SIM raw fluorescent images of the spores with the illumination mode “3D-SIM”, the camera settings to readout mode Electron Multiplying (EM) Gain 10MHz at 14-bit, and EM gain at 175. Excite the FM4-64 probe in PS4150 spores with 561 nm laser light at 20% laser power, and an illumination time of 400 ms. Excite the GerKB-mCherry and GerD-GFP in KGB80 spores with, respectively, 561 nm laser light at 30% laser power for 1 s, and 488 nm laser light at 60% laser power for 3 s. Z-Stack settings are in the top to bottom mode, 0.2 µm/ step, 7 steps and 20 steps for germinosome and IM analysis, respectively. NOTE: These laser parameters were applied in order to assure a maximum brightness value of the histogram window of around 4,000. Perform the N-SIM Slice Reconstruction for the FM4-64 stained PS4150 spores’ raw data. Click the Param button for Reconstruct Slice on the N-SIM pad tab sheet to open the N-SIM Slice Reconstruction window. Set the reconstruction parameters in the N-SIM Slice Reconstruction window. To get perfect reconstructed images, follow the suggestion of the N-SIM instructions and click on the appropriate controls in the N-SIM Slice Reconstruction window to set the Illumination Modulation Contrast (IMC) to Auto, High Resolution Noise Suppression (HRNS) to 1.00 and Out of the Focus Blur Suppression (OFBS) to 0.05 as starting points. Click the Reconstruct Slice button in the N-SIM Slice Reconstruction window to reconstruct the image. Evaluate the quality of the reconstructed images by the Fast Fourier Transformed (FFT) images and reconstruction score, which display after reconstruction12. Adjust the HRNS from 0.10 to 5.00 and OFBS from 0.01 to 0.50 by clicking on the appropriate controls in the N-SIM Slice Reconstruction window until the best parameter settings are obtained. Click the Apply button in the N-SIM Slice Reconstuction window to apply changed parameters. Click Close button to close the window. Make a FM4-64 stained PS4150 spores raw image active and click the Reconstruct Slice button on the N-SIM Pad tab sheet to execute Slice Reconstruction. Save the reconstructed image. Convert 3D-SIM raw images of KGB80 into Pseudo-Widefield images by activating with a left click the ImageJ plugin SIMcheck utility Raw Data SI to Pseudo-Widefield12. Pseudo-Widefield averages images from raw SIM data and assembles, for comparison, an image equivalent to conventional widefield illumination12. For ImageJ itself see https://imagej.net/Welcome. Randomly select ~25 spores in each inverted transmission image for later germinosome analysis in the fluorescent Pseudo-Widefield images. Select in total approximately 350 (in this example, 346) KGB80 spores in 14 fields of view from two slides. 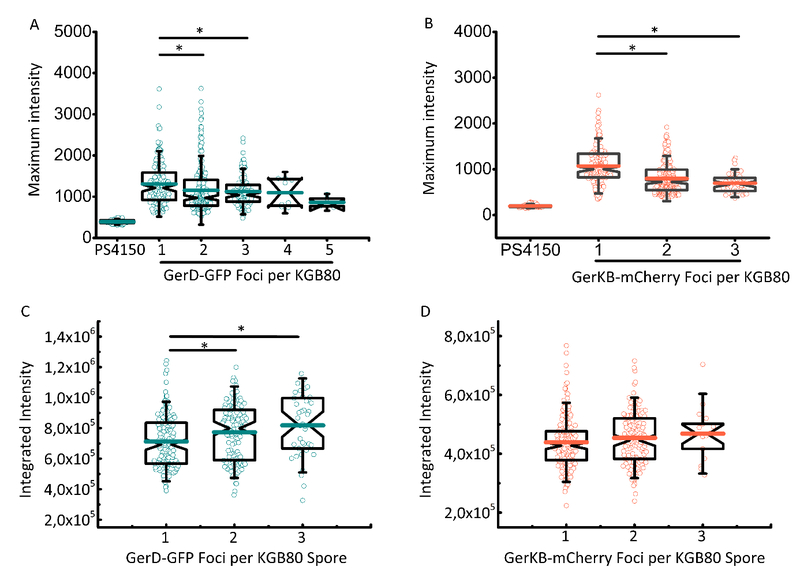 The GerD-GFP and GerKB-mCherry fluorescent foci numbers in selected KGB80 spores should be counted independently by two researchers. The researcher can refer back to the 3D-SIM raw images whenever in doubt of the presence of separate fluorescent germinosome foci in spores. Assess the maximum intensities of each GerD-GFP and GerKB-mCherry focus and the integrated intensity of each KGB80 spore’s 3D image with ImageJ. Use the mean integrated intensity value of 7 stacks as the integrated signal intensity of the KGB80 spore. Determine background intensities by imaging the background strain PS4150 using identical settings. Regard fluorescent spots in individual KGB80 spores as germinosome foci when they are clearly distinguishable from the background. Apply one-way ANOVA-tests for significance determination with software Origin 9.0. considering P values <0.05 as statistically significant. Use the Spearman’s rank correlation coefficient18 to evaluate the correlation of GerD-GFP and GerKB-mCherry foci number and the measurements of the integrated signal intensity. The current protocol presents a SIM microscope imaging procedure for bacterial spores. The sporulation and slide preparation procedures were carried out as shown in Figure 1 before imaging. Later, the imaging and analysis procedures were applied both for dim (fluorescent protein labeled germination proteins) and bright (lipophilic probe stained IM) spore samples as shown in the following text. Levels of GerD and GerKB are reported to be ~3,500 and ~700 molecules per spore, respectively, based on Western blot analyses of extracts from spores prepared in a rich sporulation medium19. Both the gerD-gfp and gerKB-mCherry genes in the KGB80 strain are under the control of their native promotor. The relative low abundance of fusion proteins led to a low fluorescent signal during imaging, so it was difficult to reconstruct such dim raw SIM images by the SIM reconstruction algorithm. 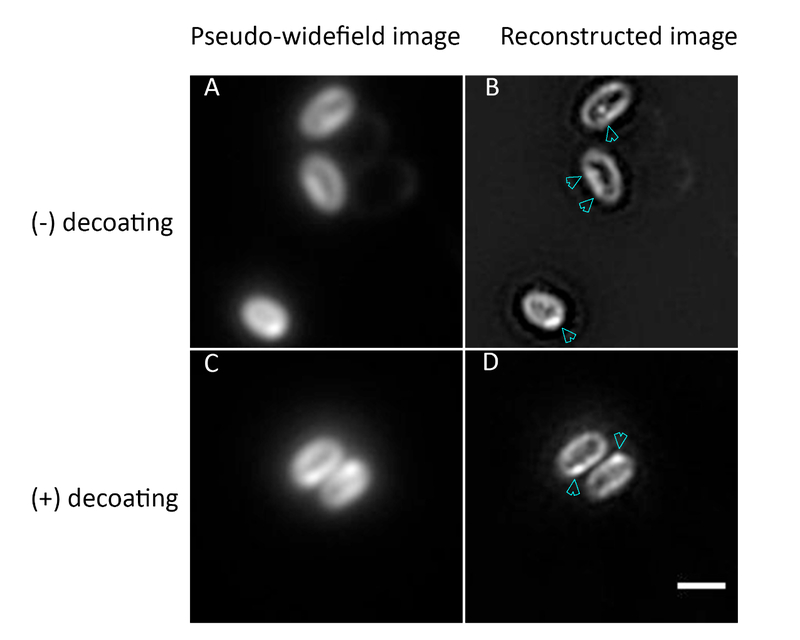 However, the SIM microscope was still applied for the germinosome image acquisition, although the raw SIM images were converted into Pseudo–Widefield images by SIMcheck (ImageJ plugin). In addition, a seven stack 3D imaging was implemented to get a better overview of this IM focus. As shown in the left hand panel of Figure 2, two foci of GerD-GFP appeared in different stacks. The, in total, three GerD-GFP foci are indicated by the white arrows in the compositive column’s Z3 stack. The right hand panel of Figure 2 shows a spore with only one GerD-GDP focal point in the spore as evidenced by the white arrow in the composite column’s Z4 stack. In total, around 40% and 50% of spores had two or one GerD-GFP and GerKB-mCherry cluster, respectively (Table 1). Among the 346 spores examined, two had 4 GerD-GFP foci, and one spore even had 5 GerD-GFP foci. Noticeably, in our hands, the number of GerD-GFP and GerKB-mCherry foci in the same spore were not always the same18. As the SIM microscope had no phase contrast option, we used transmission light microscopy for spore localization. Thus, spores appear with a dark and dense core surrounded by a brighter halo. The integrated fluorescence intensity of KGB80 spores was measured by ImageJ. Spores, which had 0, 4, or 5 foci were not included into our statistical analysis due to their low frequency. There was a high positive correlation between GerD-GFP and GerKB-mCherry integrated intensities (Spearman rank correlation coefficient = 0.73). While the integrated intensity of the GerD-GFP scaffold protein was different between different populations (Figure 3C), the integrated intensity of GerKB-mCherry was about the same in different populations (Figure 3D). The maximum fluorescence intensity of GerD-GFP and GerKB-mCherry foci tended to decrease, when the spore had multiple foci (Figure 3A, B). The maximum fluorescence of all bright spots, regarded as germinosome foci, was higher than the maximum auto-fluorescence of PS4150 spores (spores from the background strain KGB80; Figure 3A, B). As mentioned in the introduction, germinosome proteins are located in the spore’s IM. However, few details are known about the biophysical properties of this largely immobile membrane. Exploring more details, such as the IM’s local organization, would promote the understanding of the organization of IM proteins, in particular GRs and channel proteins. B. subtilis spores have a structure comprising multiple concentric layers, and a lipophilic probe cannot easily pass through these multiple layers to stain the IM surrounding the spore core. The passage of such probes is most likely hampered by the protein-rich coat layers and perhaps also the outer membrane20,21. To overcome this problem, the lipophilic membrane dye FM4-64 was added to a PS4150 culture during sporulation. By doing so, the PS4150 vegetative cell membrane was stained by FM4-64, and thus membranes in forespores obtained from this culture at the asymmetric sporulation cell division and subsequent forespore engulfment are well stained5. Consequently, the mature spore’s membranes can be visualized. A previous study indicated that most if not all of the FM4-64 is in the IM in cleaned spores5. During an approximately 2 week period of incubation and spore purification treatments, the washing procedures applied remove any FM4-64 from the outer membrane, the latter effectively being removed following the decoating treatment and extensive washing steps5. However, the decoating procedure removes no FM4-64 from the IM, nor has any effect on the germinosome foci5,6. What excited us is that brighter FM4-64 spots similar to germinosome foci appeared in both intact (Figure 4A, B) and decoated spores (Figure 4C, D) of PS4150 spores. These brighter FM4-64 spots might be involved in the clustering of germinosome proteins in the IM. Figure 1: Overview of sporulation and slide preparation. An overview displaying the initial steps required before imaging. Detailed information is given in the protocol. (A) The schematic of the sporulation procedure in defined minimal MOPS medium. A B. subtilis PS4150 (PS832 ΔgerE::spc ΔcotE::tet) or KGB80 (PS4150 gerKA gerKC gerKB-mCherry cat gerD-gfp kan) single colony was cultured in 5 mL of LB rich medium, and adapted in 5 mL and 20 mL of MOPS medium in turn, and finally sporulated in 250 mL of MOPS medium. An early exponential phase culture (OD600, 0.3-0.4) is used in all intermediate cultures. FM4-64 (2 µg/mL) was added to the PS4150 sporulation medium for spore membrane staining 1 or 2 h after reaching the peak OD600 value. (B) Method of harvesting spores from MOPS sporulation culture and purifying spores by density gradient centrifugation. (C) Procedure of stabilizing spores on 1 % agarose pad in a gene frame chamber. Please click here to view a larger version of this figure. Figure 2: Representative Pseudo-Widefield (PWF) 3D images of GerD-GFP and GerKB-mCherry foci in two KGB80 (PS4150 gerKA gerKC gerKB-mCherry cat gerD-gfp kan) dormant spores’ 3D-SIM raw images were taken with dual channel excitation (561nm, 30% laser power, 1 s, and 488nm, 60% laser power, 3 s) using 7 steps from top to bottom Z-stacks. Subsequently, the raw SIM images were converted into Pseudo-Widefield 3D images by the ImageJ plugin SIMcheck. From left to right, 3D images (Z2-Z5) of GerD-GFP (green), GerKB-mCherry (red) and the corresponding composite images of two KGB80 spores (i and ii) are shown in the panel. Transmission (Trans) light images of two spores (i and ii) indicated the location of spores that appear as dark dense images surrounded by a brighter halo. Scale bar = 1 µm and all panels are at the same magnification. Please click here to view a larger version of this figure. Figure 3: The maximum fluorescence intensity of GerD-GFP in KGB80 (PS4150 gerKA gerKC gerKB-mCherry cat gerD-gfp kan) dormant spores, and the maximum auto-fluorescence intensity of PS4150 spores in arbitrary units. All spores were illuminated by the settings indicated the protocol. Panels (A) and (B) show the maximum fluorescence intensity of the GerD-GFP and GerKB-mCherry foci, respectively, in KGB80 dormant spores as well as in both cases the maximum auto-fluorescence intensity of the parent PS4150 spores. Panels (C) and (D) show the integrated fluorescence intensity of the GerD-GFP foci and the integrated fluorescence intensity of the GerKB-mCherry foci, respectively, in B. subtilis KGB80 dormant spores. We used one-way ANOVA-tests for significance determination of differences in maximum focal point intensity and integrated spore fluorescence intensities with software Origin 9.0 considering P values <0.05 as significant. Spores with 4 or 5 foci were excluded from the analysis because of their low abundance. The data is represented in notched boxplots. The notches in the plots are around the median values observed with their width proportional to the interquartile range (IQR). The whiskers shown represent a maximum of 1.5 the IQR. Asterisks indicate a significant difference of median values. GerD-GFP and GerKB-mCherry integrated fluorescence intensities have a strong positive correlation (Spearman correlation coefficient = 0.73)18. Please click here to view a larger version of this figure. Figure 4: Representative Pseudo-Widefield (PWF) images (A and C) and reconstructed SIM images (B and D) of the FM4-64 stained IM of B. subtilis PS4150 (PS832 ΔgerE::spc, ΔcotE::tet) spores. FM-464 was incorporated into spores during sporulation. 3D-SIM raw images of intact spores (A and B) and decoated spores (C and D) were taken with one channel excitation (561 nm laser, 20% laser power, 400 ms) using a 25 step top to bottom Z-stack. Subsequently, the raw SIM data was reconstructed by the microscope imaging software (see Table of Materials) into 3D-SIM images, or converted into PWF by SIMcheck (ImageJ plugin). The cyan arrows point to FM4-64 foci in the IM in panel B and D. Scale bar = 1 μm and all panels are at the same magnification. Please click here to view a larger version of this figure. Table 1: Presence of foci in KGB80 spores. The germinosome foci number per spore in a population of dual labeled B. subtilis KGB80 (PS4150 gerKA gerKC gerKB-mCherry cat gerD-gfp kan) dormant spores. Fluorescence in spores was counted as germinosome foci when a focus’ maximum intensity was higher than the auto-fluorescence intensity, which was the maximum intensity of PS4150 (PS832 ΔgerE::spc ΔcotE::tet) dormant spores excited by the same illumination settings as the KGB80 spores. The protocol presented contains a standard 3D-SIM procedure for analysis of FM4-64 stained B. subtilis spores that includes sporulation, slide preparation and imaging processes. In addition, the protocol describes a modified SIMcheck (ImageJ)-assisted 3D imaging process for SIM microscopy of B. subtilis spore germinosomes labeled with fluorescent reporters. The latter procedure allowed us to observe this dim substructure with enhanced contrast. By coupling two imaging procedures, it is possible to visualize discrete sub-structures in the same spore with the same SIM microscope, thus improving our basis for a mechanistic understanding of the germination process. Note that the procedure operates at a lateral resolution of ~100 nm and an axial resolution of ~200-250 nm. This is better than the Differential Interference Contrast (DIC) wide-field microscopy approach used by Griffith7. Time resolved analysis of germinosome appearance upon initiation of germination would be a desired next step. Unfortunately, though SIM microscopy is in principle compatible with live-imaging, due to the dim nature of the germinosome signals such time-resolved SIM, analyses are not feasible because of rapid bleaching of the samples during image acquisition. In order to obtain sufficient spores for analysis, it is crucial to make sure that sporulation is efficiently taking place. Researchers must therefore check sporulation efficiency meticulously with 90% efficiency as the target. In the representative results, in dormant spores, respectively ~50% and 40% of all spores have one or two GerD-GFP and GerKB-mCherry foci (Table 1). The percentage of spores with two foci is much higher than that reported by Griffiths previously7. There are several reasons that could explain the different result in the current work. First, the 3D imaging process could facilitate the detection of more foci. Different foci in the same spore are located in different locations in the vertical direction as shown in Figure 1. Second, the CCD camera (Table of Materials) and laser unity equipped to the SIM microscope contribute significantly to the imaging results. Third, similar to Griffiths’s approach7 to average dozens of consecutive images for better image analysis, the Pseudo-Widefield image of the germinosome was also an average image from raw SIM images (5 phases and 3 orientations images). Finally, the sporulation medium and sporulation conditions, an important variable in determining spore properties, are different in our work from that used previously. Griffiths et al.7 used rich 2x Schaeffer’s-glucose (2x SG) medium for sporulation, while a defined minimal MOPS buffered medium was employed here. Several papers have demonstrated that sporulation medium and conditions have significant effects on the protein composition, resistance, and germination of B. subtilis spores22,23,24,25. Indeed, it has been shown that levels of GR subunits are 3- to 8-fold lower in spores obtained on a poor medium versus those obtained on rich-medium. GerD levels were also around 3.5-fold lower in poor medium spores, and these spores took longer to start spore germination26. However, it is not clear whether sporulation conditions also influence the number of observed germinosome foci. Ramirez-Peralta et al.’s results26 indicated that rates of nutrient germination of spores at population levels are influenced significantly by the levels of germination proteins and GerD. If the integrated fluorescent intensities per spore from the fluorescent reporters are directly proportional to the levels of GerD and GerKB fusion proteins, levels of both fusion proteins differ widely in KGB80 spores, which is in agreement with previous work7. This protein level heterogeneity might be related to spore germination heterogeneity observed at the single spore level, and germinosome foci number might be another factor contributing to spore germination heterogeneity. Further experiments will focus on an analysis of the possible effect that germinosome foci number and foci germination protein composition (not all germinosomes may be equal in germination protein composition) could have on germination heterogeneity. The data gave rise to a number of current research questions including: i) what is the role of GerD in the clustering of GRs in the IM; and ii) how are the two other GRs, GerA and GerB, organized in the spore IM? The protocol presented for dim and bright spore samples makes it possible to visualize discrete sub-structures in the same spore by SIM microscopy. The bright FM4-64 spots that were observed in spores might be due to extensive folding of the IM27. Alternatively, we hypothesize that these regions are areas of the IM where the dye could more easily gain access to due to increased local IM fluidity. Such Regions of Increased Fluidity (RIFs) may be organized by the cytoskeletal actin homologue MreB, well known for its concentration of fluid short acyl chain lipids28,29. Noticeably, applying the same procedure to wild-type B. subtilis spores also leads to a similar pattern of bright FM4-64 spots (our unpublished observations). In B. subtilis vegetative cells, a collapsed membrane potential results in the clustering of MreB and RIFs29. The inner membrane of dormant spores likely has a relative low membrane potential20,21 and contains detectable levels of MreB30 which might lead to the clustering of RIFs into larger domains of high fluidity29. Whether such domains could coincide with the presence of germinosomes is currently under investigation. The authors thank Christiaan Zeelenberg for his assistance during the SIM imaging. JW acknowledges the China Scholarship Council for a PhD fellowship and thanks Irene Stellingwerf for her help during the primary stage of imaging. Setlow, P. Germination of spores of Bacillus species: what we know and do not know. Journal of Bacteriology. 196, (7), 1297-1305 (2014). Setlow, P., Wang, S., Li, Y. -Q. Germination of spores of the orders Bacillales and Clostridiales. Annual Review of Microbiology. 71, (1), (2017). Vepachedu, V. R., Setlow, P. Analysis of interactions between nutrient germinant receptors and SpoVA proteins of Bacillus subtilis spores. FEMS Microbiology Letters. 274, (1), 42-47 (2007). Setlow, P. Summer meeting 2013–when the sleepers wake: the germination of spores of Bacillus species. Journal of Applied Microbiology. 115, (6), 1251-1268 (2013). Cowan, A. E., et al. Lipids in the inner membrane of dormant spores of Bacillus species are largely immobile. Proceedings of the National Academy of Sciences of the United States of America. 101, (20), 7733-7738 (2004). Loison, P., et al. Direct investigation of viscosity of an atypical inner membrane of Bacillus spores: a molecular rotor/FLIM study. Biochimica et Biophysica Acta (BBA)-Biomembranes. 1828, (11), 2436-2443 (2013). Griffiths, K. K., Zhang, J., Cowan, A. E., Yu, J., Setlow, P. Germination proteins in the inner membrane of dormant Bacillus subtilis spores colocalize in a discrete cluster. Molecular Microbiology. 81, (4), 1061-1077 (2011). Troiano, A. J., Zhang, J., Cowan, A. E., Yu, J., Setlow, P. Analysis of the dynamics of a Bacillus subtilis spore germination protein complex during spore germination and outgrowth. Journal of Bacteriology. 197, (2), 252-261 (2015). Wegel, E., et al. Imaging cellular structures in super-resolution with SIM, STED and Localisation Microscopy: A practical comparison. Scientific Reports. 6, 27290 (2016). Pandey, R., et al. Live cell imaging of germination and outgrowth of individual Bacillus subtilis spores; the effect of heat stress quantitatively analyzed with SporeTracker. PloS One. 8, (3), e58972 (2013). Demmerle, J., et al. Strategic and practical guidelines for successful structured illumination microscopy. Nature Protocols. 12, (5), 988-1010 (2017). Ball, G., et al. SIMcheck: a toolbox for successful super-resolution structured illumination microscopy. Scientific Reports. 5, 15915 (2015). Bertani, G. STUDIES ON LYSOGENESIS I.: The Mode of Phage Liberation by Lysogenic Escherichia coli1. Journal of Bacteriology. 62, (3), 293 (1951). Pandey, R., et al. Quantitative analysis of the effect of specific tea compounds on germination and outgrowth of Bacillus subtilis spores at single cell resolution. Food Microbiology. 45, 63-70 (2015). Zheng, L., et al. Bacillus subtilis spore inner membrane proteome. Journal of Proteome Research. 15, (2), 585-594 (2016). Vepachedu, V. R., Setlow, P. Localization of SpoVAD to the inner membrane of spores of Bacillus subtilis. Journal of Bacteriology. 187, (16), 5677-5682 (2005). Schouten, M., et al. Imaging dendritic spines of rat primary hippocampal neurons using structured illumination microscopy. Journal of Visualized Experiments: JoVE. (87), (2014). Mukaka, M. M. A guide to appropriate use of correlation coefficient in medical research. Malawi Medical Journal. 24, (3), 69-71 (2012). Stewart, K. A., Setlow, P. Numbers of individual nutrient germinant receptors and other germination proteins in spores of Bacillus subtilis. Journal of Bacteriology. 195, (16), 3575-3582 (2013). Laflamme, C., et al. Flow cytometry analysis of germinating Bacillus spores, using membrane potential dye. Archives of Microbiology. 183, (2), 107-112 (2005). Magge, A., Setlow, B., Cowan, A. E., Setlow, P. Analysis of dye binding by and membrane potential in spores of Bacillus species. Journal of Applied Microbiology. 106, (3), 814-824 (2009). Ghosh, S., Scotland, M., Setlow, P. Levels of germination proteins in dormant and superdormant spores of Bacillus subtilis. Journal of Bacteriology. 194, (9), 2221-2227 (2012). Abhyankar, W. R., et al. The influence of sporulation conditions on the spore coat protein composition of Bacillus subtilis Spores. Frontiers in microbiology. 7, 1636 (2016). Rose, R., et al. Comparison of the properties of Bacillus subtilis spores made in liquid or on agar plates. Journal of Applied Microbiology. 103, (3), 691-699 (2007). Stewart, K. A., Yi, X., Ghosh, S., Setlow, P. Germination protein levels and rates of germination of spores of Bacillus subtilis with overexpressed or deleted genes encoding germination proteins. J Bacteriol. 194, (12), 3156-3164 (2012). 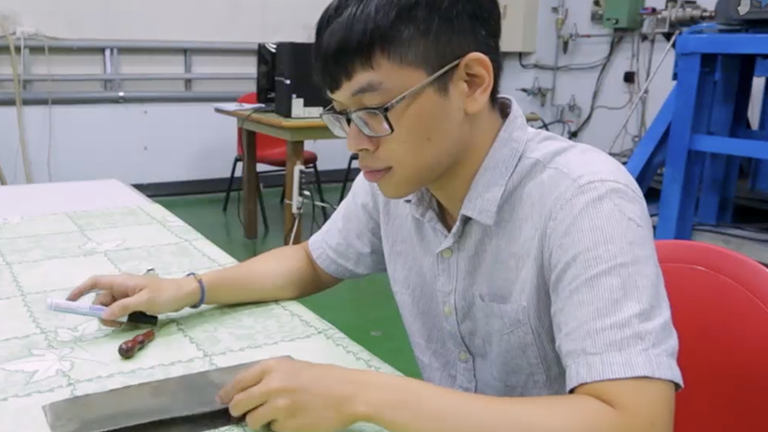 Ramirez-Peralta, A., Zhang, P., Li, Y. -q, Setlow, P. Effects of sporulation conditions on the germination and germination protein levels of Bacillus subtilis spores. Applied and Environmental Microbiology. 78, (8), 2689-2697 (2012). Laue, M., Han, H. -M., Dittmann, C., Setlow, P. Intracellular membranes of bacterial endospores are reservoirs for spore core membrane expansion during spore germination. Scientific Reports. 8, 11388 (2018). Strahl, H., Bürmann, F., Hamoen, L. W. The actin homologue MreB organizes the bacterial cell membrane. Nature Communications. 5, (2014). Strahl, H., Hamoen, L. W. Membrane potential is important for bacterial cell division. Proceedings of the National Academy of Sciences of the United States of America. 107, (27), 12281-12286 (2010). Swarge, B. N., et al. "One-Pot" sample processing methodfor proteome-wide analysis of microbial cells and spores. Proteomics Clinical Applications. (5), 1700169 (2018).